Plain yogurt might taste tart to your tongue and absent of any kind of sugar, but sugar is present in plain yogurt, says the American Dietetic Association. Sugar occurs naturally in many foods, and it's in the milk used to make plain yogurt. The amount of sugar in your plain yogurt can vary by the brand. Sugar occurs naturally in foods such as fruits, vegetables, milk and milk products, and some whole grains, but it also can be added to foods that are processed. MayoClinic.com defines sugars as a simple carbohydrate that give you energy. Added sugars, absent in nutritional value, are found in processed foods. They enhance flavor, texture and color; sugar also acts as a fermenting, bulking and preservation agent. A little bit of added sugar to reduced-fat and non-fat milk products, such as yogurt, can make them more palate-pleasing to children and other people who might otherwise pass them by. The natural sugar in plain yogurt comes from its lactose content, says the ADA. Plain yogurt contains 12 grams of sugar for every 6-ounce container, on average. Fruit-flavored yogurts, on the other hand, can be quite sugary, depending on the amount of sugar added, but the ADA indicates that adding fruit and other sweeteners to yogurt boosts the food's sugar content by around 14 grams for a total of around 26 grams of sugar per 6-ounce serving. Light and low-calorie yogurts use artificial sweeteners to reduce the sugar content and contain between 12 and 14 grams of sugar for every 6 ounces. As noted by the ADA, the amount of sugar in yogurt can vary considerably, so if sugar is your concern, careful study of the products' Nutrition Facts panel is a must, after which your ultimate choice depends on the plain yogurt's brand. Yoplait Greek plain yogurt contains 9 grams of sugar in every 6-ounce container. Dannon All Natural plain non-fat and low-fat yogurt contain 12 grams of sugar in the same serving size. Stonyfield Smooth and Creamy fat-free and low-fat plain yogurt contain 11 grams of natural sugar in every 6-ounce container. The calories you get from added sugar are considered discretionary calories, explains MayoClinic.com, which goes on to explain that these calories come from sweets, fats and alcoholic beverages. Discretionary calories are yours to consume only if you have them to spare after eating a healthy daily diet rich in fruits, vegetables, whole grain foods, lean proteins and low-fat milk products. The U.S. Department of Agriculture's guidelines for sugar consumption indicate that if you eat a 2,000-calorie diet, you can get 267 discretionary calories from sugar, fat and alcohol per day. The Centers for Science in the Public Interest points out that unless you choose plain yogurt, it's impossible to know how much sugar in your flavored yogurt comes from milk and added fruit and sweeteners. 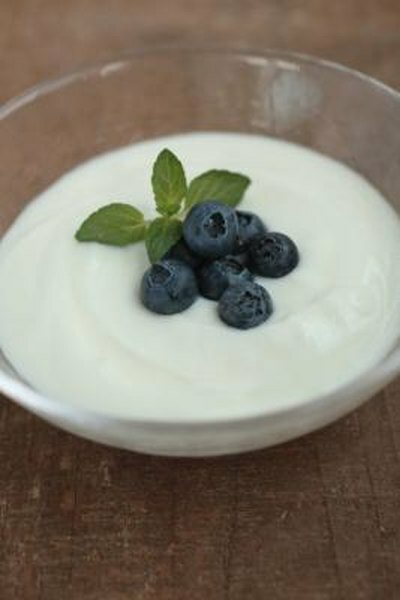 The CSPI suggests choosing fat-free or low-fat plain yogurt and sweetening it with fresh fruit to avoid unneeded sugar. According to the CSPI, an 8-ounce cup of Dannon Lowfat sundae-style yogurt contains 6 teaspoons of added sugar. For comparison, a glass of fat-free chocolate milk contains 4 teaspoons. Added sugar means you consume more calories and get less benefit from the yogurt's other vital nutrients, such as calcium. American Dietetic Association: Why Does Yogurt Have So Much Sugar?